The Visual Dissection – The Art of Anatomy exhibition in the Main Library will give visitors an extremely rare opportunity to see a range of collections from the University’s Anatomical Museum, some of which have never been on display to the public before. The exhibition will tell the story of how anatomical representation of the body has changed over the years, taking you on a journey from the woodcuts and engravings of the 17th and 18th centuries, to the wax and papier mâché models of the 19th and 20th centuries, and then on to the digital technologies of today. The late 18th and early 19th century was a golden age for the production of anatomical models and the Anatomical Museum collections are particularly rich with examples from across Europe. 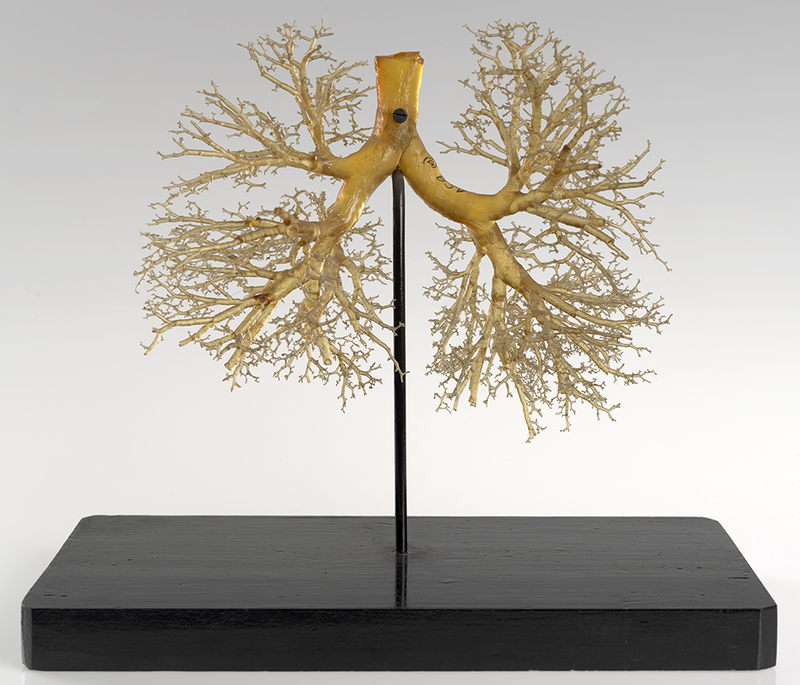 Exotic sounding manufacturers like ‘Maison Tramond’ and ‘Ziegler’ are well represented in the exhibition and visitors will be able to see for themselves the exquisite craftsmanship required to produce a resin cast of a lung or the corrosion cast of a foot. These objects have been used to help teach generations of medical students in the Anatomy Department at the University of Edinburgh. Many of the models on display are so accurate and detailed in their anatomical representation that they are still used for teaching today. 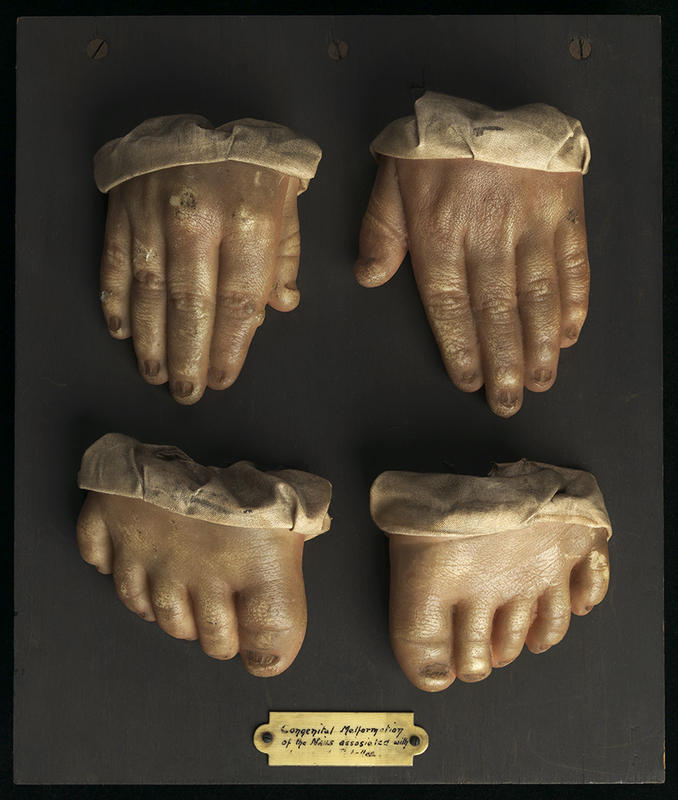 Wax moulage of hands and feet, early 20th century. This moulage shows a congenital malformation of the nails. Part of the richness of this exhibition comes from the fact that these treasures of the Anatomical Collection are complemented by works from the University’s Fine Art and Special Collections. A particular notable example is the inclusion of Giambologna’s écorché figure of a horse (dating from 1585) from the Torrie Collection, which will be displayed for the first time alongside another of the University’s iconic items, Carlo Ruini’s Anatomia dell cavallo, infermita, et suoi rimedii (from 1618). As well as these rare illustrated books and the unique anatomical casts and models, the exhibition will also include a life sized hologram of the human body, believed to be the largest anatomical hologram ever made. Visual Dissection presents the anatomical models on display as being a product of innovative collaborations between the worlds of art and science and perhaps just as importantly as works of art in their own right. Highlighting these collaborations in the displays is entirely appropriate as the exhibition itself is the result of a partnership between Doug Stevens, a 5th year student at Edinburgh College of Art, and the Anatomical Museum. Doug put the Visual Dissection exhibition proposal together as part of his Employ.ed internship. Doug’s initial exhibition vision was made into a reality thanks to the input of Anatomical Museum staff and additional funding from the Biomedical Teaching Organisation, Edinburgh College of Art, the School of Medicine and the Anatomical Society. Visual Dissection – The Art of Anatomy opens in the University of Edinburgh Main library gallery on the ground floor on 4th December and runs until 5th March 2016, it is open Monday – Saturday from 10am to 5pm and admission is free.